feeling listless -- "Poverty of goods is easily cured; poverty of the mind is irreparable." feeling listless: Daleks In Manhattan. TV I'm not someone who tends to nitpick. I really enjoyed last week's episode and it wasn't until later when I read some of the reviews that the inconsistencies and potential plot holes became apparent - and even then I don't think any of them spoiled it for me. Because you know. The Macra. Sometimes I'll work through a rationalization for something or I'll simply let it go because the whole thing has been so damn entertaining. I didn't even notice the character reading a copy of the Radio Times. "Was that a football goal? I suppose it must be if this was filmed in a park in Cardiff. I wonder how they didn't notice that. Did they notice it and decide it would have been too expensive to paint out? Or did they just not notice right through filming to editing to colour timing to composing to well all of the other processes before it hit the screen. But what if it wasn't a football goal. I'll have to check it again when I've finished recording. Just enjoy the episode. But it could have been a soccer goal. Perhaps it was supposed to be there. Is this going to be the meme of the year - subliminal anachronisms across time? What if soccer was quite popular in depression era New York - it's easier to play than American Football - you just need a large round ball. Surely they would have played baseball. Unless it was just something they didn't notice …"
Luckily, since I have a decent brain capacity there was still enough juice in the other third to actually quite enjoy what was in essence a pretty old school slice of Doctor Who, a Hartnell story with production values. 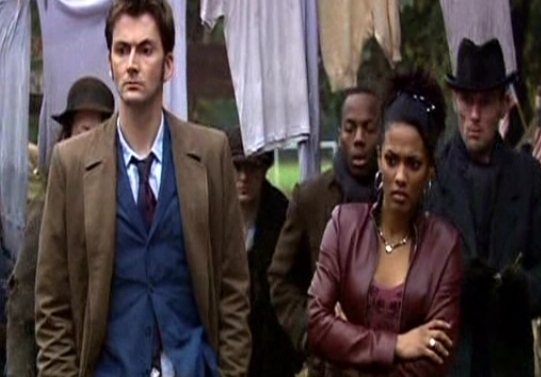 The opening ten minutes featured exactly the kind of edutainment you might find in the opening episode of a Lucarroti-style historical with the Doctor revealing the era and its problems. Its exactly what the series should be about - stepping into history having a look around. In recent years a shorthand has crept into use in these situations, but for once the Doctor was actually given the chance to offer a lecture and it really helped to set the scene. "The opening ten minutes featured exactly the kind of edutainment you might find in the opening episode of a Lucarroti-style historical with the Doctor revealing the era and its problems. " Another trait of early Who was the grand shift between locations, the gang traveling across a world. Then it was because they generally had to strike a set on a weekly basis and it meant that by sometimes changing everything they could add value. Translating this story into a seven-parter, you could almost imagine 'Episode One - The Poor In Manhattan' 'Episode Two - The Sewer' 'Episode Three - A Dance With Death' and so on, the narrative generally staying on the Doctor and Martha except for the cutaways to Daleks. And again, in keeping with those old stories, we knew who the main adversary was before the timelord, which is something that doesn't usually happen these days (I think Boomtown is an exception). The Doctor spent most of the story trying to discover who his adversary was, almost dragged through through the story, being shown all of the plot details that need to be established ready for the Evolution of the Daleks. In that way it did feel like the first proper Dalek story - for once they're not simply trying to blast their way to victory using sheer force but have instead a proper plan for their survival, even if it chucks out exactly who they are and all of the arguments they've had previously about being the supreme being just as they are. I loved the moment when they actually paid lip service to this, rationalizing something which actually caused a war in the Eighth Doctor audio Blood of the Daleks. Where the episode parted company with the earlier era was that with the exception of the aforementioned crossbar the sense of place was beautiful, the trip to New York for background plates being money well spent. It's a pity that the budget wouldn't stretch to allowing up to see the travelers walking through the mass of the city but actually it seems right that the Doctor should stay on the edges in these kinds of stories, fitting into the gaps. But the Empire State interiors with their art deco style were beautifully realised, as was the back stage of the theatre (shades of Weng Chiang actually). I mean if you look at the costumes, its amazing what is actually being realised on a tv budget - the almost unrecognizable Miranda Raison sparkily making a perfect angel. "It's a pity that the budget wouldn't stretch to allowing up to see the travelers walking through the mass of the city but actually it seems right that the Doctor should stay on the edges in these kinds of stories, fitting into the gaps." And this was all tied together, not with a bit of stock music from the radio archives, but with a wonderful score that just found the right balance between the more traditional incidental spots and the more evocative tracks; Murray Gold who I'm actually beginning to admire as a composer borrowing extensively from Woody Allen's playbook. I love that the new series is confident enough to embrace contemporary music and it just seems perfect that the Tardis doors should open to the sound of Gershwin. I do wonder what the whole episode would have been like had it been scored just like an Allen film but I can't think of any jazz music that could underscore the creepier moments featuring the pig blokes - and if you trying an drop in some faux-saxophones it can sound very jokey and very wrong. But in the end, my favourite moment? "They always survive, while I lose everything." See you next week, Helen. It should have been 'Daleks Take Manhattan'. "The spirit of the time shall teach me speed."